Before visiting Washington, D.C. for the weekend with her husband, Meegan reached out to me for photos to use on signedM, her lifestyle blog. Meegan is all about sharing her life, inspiring others, and empowering female entrepreneurs. In addition to her life+style blog, she also runs a co-working space in Cedar Rapids solely for women. How awesome is that? Take one look at Meegan and you can feel her confidence. In real life, she is just as stylish and effortless as she seems in front of the camera. She was a ton of fun to photograph and was up for anything I threw at her. 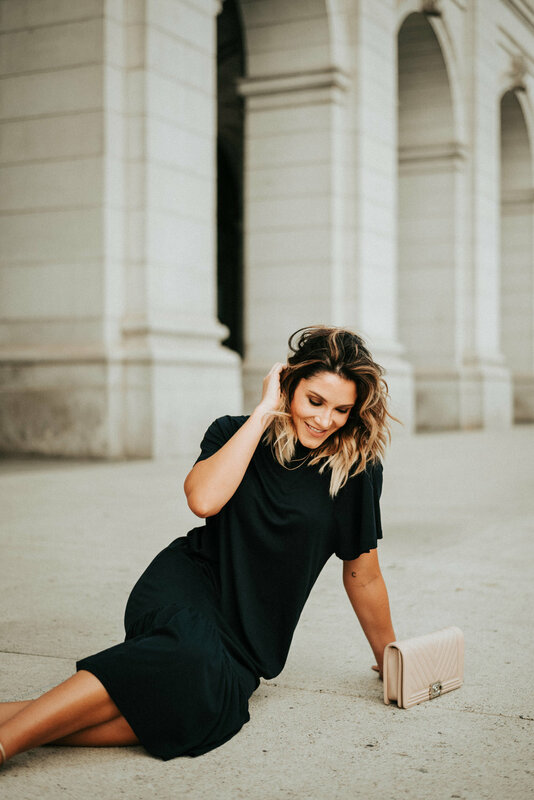 We adventured around the city snapping shots at Union Station, the United States Capitol, and along the streets of D.C. We got some beautiful editorial type photos for her to use on her blog. I LOVE shooting weddings and engagement sessions, but it's fun to do something a little different and focus on portraits. One big difference: weddings and engagements are focused on the connection between the couple, and individual portraits are all about the subject's empowerment and personality. Now don't get me wrong, there was plenty of connection and romance between Meegan and her husband, Dennis! They are such a sweet couple. Very flirty and very much in love! Dennis was incredibly supportive of Meegan—carrying around her outfit changes while we explored the city and chatting with me while she changed outfits. I captured some sweet moments between them while we explored the city. Oh, did I mention that they greeted me with champagne when we first met? Seriously, that was such an amazing way to break the ice and get to know each other better. Overall, this was a great day with two wonderful people in a beautiful city! I would love to do more sessions like this, so reach out if you need portraits for your blog or business. The architecture of D.C. is amazing for these types of sessions, but I am also happy to travel anywhere in the world to get the perfect photo! Let me know which of Meegan's photos is your favorite in the comments below!